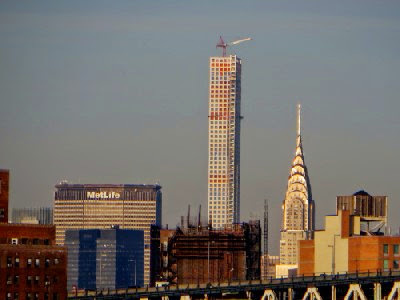 432 Park Avenue (center in the photo above) claims the title of tallest residential building in the Western Hemisphere, and second tallest building (after the new One World Trade Center) in New York City, but if measured by roof height the tallest. It's described by its architect, Rafael Viñoly, as designed around "the purest geometric form: the square." Not only is the building's horizontal cross section a square, but all the windows are squares. It dominates the midtown skyline with the grace of a colossal headless Pez dispenser, or upraised middle finger (the photo above was taken from Pier 1, Brooklyn Bridge Park). Aaron Betsky admires its "relentlessness"; I demur. Betsky also celebrates how 432 Park "represents the transformation of this and every other city into a place for the wealthy to live and play" as if driving out struggling artists and other relatively impecunious but creative people, and the inexpensive infrastructure that supports them, constitutes progress.